At Chez Bullhog, we love asparagus. Steamed, sautéed or lightly grilled with olive oil and a bit of salt – we just can’t get enough of the succulent spears. Deep-sea scallops evoke the same descriptions although they come from the sea and not the garden: sweet, tender and flavorful. Put these two together in a dish and you can’t go wrong. The road to risotto, however, is a bit more circuitous. First let me tell you: I’ve had more than my share of disasters with rice. There was the seafood ‘paella’ I made on a boat one time to impress the skipper. I combined fresh seafood and vegetables with rice of unknown origin that even after an hour of simmering failed to soften beyond jaw-numbing hardness. Then there was the expensive Japanese rice I once bought for my Japanophile son that went straight from uncooked rice to inedible mush. I could tell you others. The point is, rice is never just rice. There are rice varieties out there for very specific dishes. Long grained basmati rice for Indian pilaus and birianis. Bomba rice for Spanish paella. And for Italian risotto, there’s Arborio rice, available now in many grocery stores. 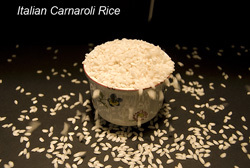 Recently, thanks to Carmelita at CookItaly, I’ve discovered another Italian rice called Carnaroli, which is available here in Seattle at Pacific Food Importers. It’s slightly smaller grained than Arborio, and has a more delicate texture. For the extra dollar or two it costs for a box, I’d say it’s well worth it. You can certainly substitute the more readily available Arborio in the recipe below, with excellent results. Now, as to what went wrong with the rice dish I cooked (and cooked and cooked) on that boat? Besides using the wrong rice, I think I committed the cardinal sin of rice cooking: never add cold liquid to rice after it’s begun cooking – it shocks the rice into not cooking properly. But to set the record straight: the skipper was impressed that I’d even attempted to cook such a dish in that tiny galley with its alcohol stove, even if it did turn out to be fish food. Chalk one up to experience! 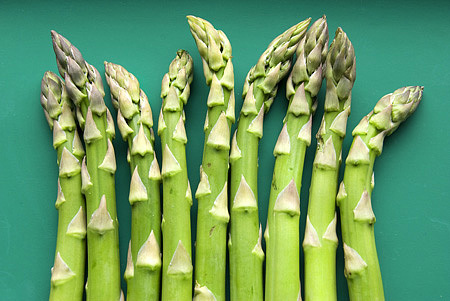 Prepare the asparagus: Wash the asparagus and snap each stalk in half. Cut the bottom halves into pieces and boil them for 10 minutes in 12 ounces of water. Discard these woody bits and save the water. Cut the top halves into three portions. Boil these more tender pieces in the same water for 5 minutes. Set the asparagus pieces to one side and save the water that now has been infused with the asparagus flavor. Cook the scallops: Drain the scallops and dry well between layers of paper towel. 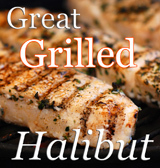 Put a heavy bottomed 10″ or 12” sauté pan over medium-high heat and add a Tablespoon of oil and a teaspoon of butter. Salt and pepper one side of the scallops and, when the pan is nice and hot, cook the scallops for 2 minutes on the seasoned side. Remove to a plate, salt and pepper the other side of the scallops, and put any liquid from the pan in with the asparagus water. 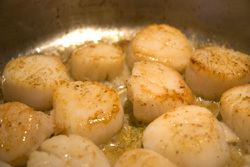 Add another Tablespoon of oil and a little butter and cook the other side of the scallops for 2 minutes. Break the barely cooked scallops into pieces. Remove to a plate and keep the scallops warm in a 200º oven. Put any juices from the pan in with the asparagus nectar. Deglaze the pan with a few Tablespoons of water or white wine, as desired, and add the liquid to the asparagus water. Finish the broth and keep hot: Bring the asparagus water back to temperature, add the 2 cups of broth and the other 8 ounces of water and let simmer. Depending on the saltiness of the broth, you may want to add a little more salt, according to taste. By now, you will have a very nice broth with which to season the rice. Keep it hot but not boiling as you cook the rice. Make the risotto: Sautee the chopped onion in 2 Tablespoons of oil and a Tablespoon of butter over medium heat until translucent. Add the dry rice and cook for 1 minute, stirring constantly. Add the white wine and simmer for 1 more minute. Raise the heat on the burner to medium high and set the timer for 16 minutes. Add 1 cup of the hot broth and allow it to cook in for 3 or 4 minutes. Then add another cup of broth, stirring to lift the rice off of the bottom. Add more hot broth as necessary to keep the rice wet and just a little soupy, keeping the heat fairly high throughout. Three minutes before the time is up, add the scallop pieces and any juice from the plate. One minute before time is up add the asparagus and carefully incorporate so the tips don’t break apart. Add a small amount of broth if the rice is super-absorbent. There should always be a little extra liquid in the pan. When the time is up, remove from the heat and mix in the cheese. Top the risotto with a spoonful of parmesan and serve piping hot with crusty bread. 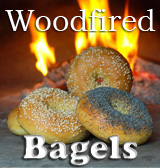 Such good flavors – enjoy! So many of my favorite things all in one dish! What a beautiful risotto. Some of my favorite ingredients here all in one dish! Great risotto making tips; I agree with the keeping the broth hot rule. Isn’t that something about rice…and the experiences that happen when serving it to guests? I will be on the lookout for carnaroli. I usually can’t go wrong with calrose. 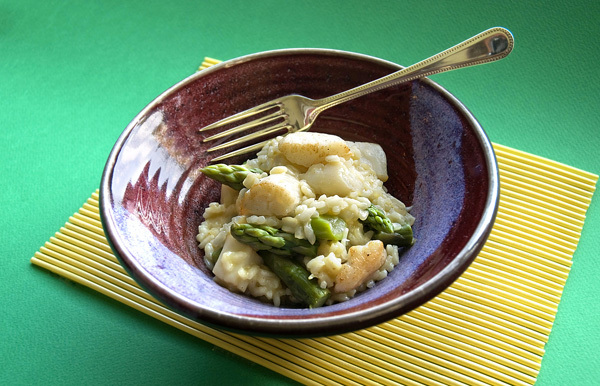 Beautiful Asparagus and sea scallop risotto. thanks for these tips great job! Two of my favorite ingredients in one of my favorite dishes! Looks yummy!! Beautiful dish! There is nothing more rewards flavor wise and texture wise then a good risotto. This one looks like it fits the bill! Asparagus is – once again – my favorite thing with spring. Your recipe looks delicious. Mmm. this looks fabulous! great spring recipe. For some crazy reason, I’ve never made risotto! Thanks for the inspiration to give it a try – I love both scallops and asparagus, so this would be an excellent recipe for my first attempt! Oh and thanks for the rice cooking tips, I’ve also had my share of rice disasters. After having made your pizza a few times now, and loving every bite of it, I’m now about to try this recipe. I should mention that I have never made risotto, I love scallops and asparagus and I am confident that someone who can come up with a pizza as delicious as yours is, would not steer me wrong on the risotto. One question though – it seems like a long time to be cooking the asparagus. Should it really be cooked that long? Only the pieces from the top half of the asparagus spears go into your risotto, and with 5 minutes boiling they will be perfectly cooked and tender. Before you do that, however, you’ll want to boil the bottom halves for 10 minutes only to extract the flavor. Save the water they were boiled in and discard those pieces. Cheers and happy risotto making! Thanks for your reply. It would have helped had I read the recipe more carefully. I will be making this and will post my results. Thank you. How beautiful – and some of it is seasonal and local at Farmer’s market. It’s singing spring to me and I shall sing back. This is stunning.. absolutly stunning..
You’ve got a lot of my favorite things in this risotto. I can almost taste it–yum! if i am making this for 2, can i just half the portions? You can halve the sea scallops and asparagus if you like, but I would do about 2/3 of the rice. Otherwise, it will have more of a tendency to stick to the pan. I made this the other night and it was beautiful. Thank you for this recipe. Now I want to make it again for my sisters. However, she does like asparagus as much as I do but loves mushrooms. Any idea how I can replace the asparagus with the mushroom? To make this ahead and reheat, I’d suggest using ‘bomba’ rice, or similar Spanish rice for making paella, instead of the more expensive arborio. The cooking technique is essentially the same, but Spanish rice allows for a longer finish. The difference is that in risotto, Italians are looking for ‘al dente’ or slightly nutty texture with a creamy finish, while Spanish paella is a bit more cooked. In any case, once you reheat, the rice will continue to absorb the liquid. To reheat, I’d put the risotto (if we can still call it that!) in a lasagna pan or broad-based casserole so that the rice is no more than 1″ or so deep. Sprinkle with some extra broth or water and bake at 375 for 15 minutes.